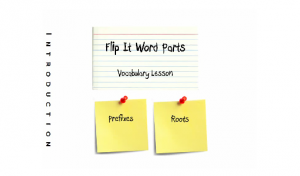 A vocabulary lesson from a LessonCast. For all the gadgets and software and devices out there available to educators, what technology do they really need? Do we stop long enough to ask? The exhibition hall at ISTE 2011 was a mammoth affair, but walking up and down the seemingly endless aisles, I wondered which of these are really necessary? The question has been on my mind at least as long as the Startup Weekend Edu last month, when (as we covered here) teams came together to pitch, design, and build an ed-tech startup over the course of an intensive weekend. There were several teachers at the event, and it was interesting to hear their ideas about technology products and services. One of the teams at Startup Weekend that worked on a teacher-driven idea was LessonCast, and I had the sense as the team pitched their idea at the end of the weekend, that some of the investors and non-educators on the judging panel just didn't "get it." "I'm not sure who would use it," was one response. "Well, teachers," said the founders. The idea behind LessonCast is to enable teachers to make short, two-and-a-half minute videos explaining a particular lesson or classroom management strategy. Unlike other sites devoted to online instruction, LessonCast isn't about teachers teaching students per se, but rather teachers teaching and mentoring other teachers. "We're trying to help build the expertise of teachers and to share that," says LessonCast co-founder Nicole Tucker-Smith, who points to her own experiences as a novice teacher turning to more experienced educators for help with lesson plans, project ideas, and classroom management tips. The startup wants to help educators share content via video, matching new and experienced educators, not just in the content of the tips and tricks and lessons, but in the production of the videos themselves as well. "We're trying to give teachers a greater voice," she says, not use technology or video instruction to replace or "skirt around them." LessonCast's mission is helping teachers share content, but it's also about helping foster mentor relationships -- both online and offline. Tucker-Smith says the startup has connections with several universities in order to get the product out to student teachers and in professional development settings. Having just founded the startup last month, LessonCast still has a lot to work out. One thing the founding team knows is that it must make that process of creating the videos as simple as possible. The founding team understands the limitations on teachers' time and technology -- both Tucker-Smith and another one of her co-founders, Katrina Stevens, are educators themselves. Balancing education and entrepreneurship is no easy task (and the startup is looking for engineering talent as well as weighing its investment options). But LessonCast is confident that it's building a tool that teachers want and need.